Check out our revamped booklists! We’re still updating a few, but we’ll post them as they are completed. And, if you have a request for a subject or genre, let us know! On September 17, 1862, one of the bloodiest battles in American history took place near the small town of Sharpsburg, Maryland. The Battle of Antietam lasted only one day, but resulted in over 23,000 deaths. The victory, claimed by the Union forces, encouraged President Lincoln to issue his Emancipation Proclamation on September 22. The Fog of Gettysburg: The Myths and Mysteries of the Battle – Ken Allers, Jr. Put on your fluorescent tees, throw on the gigantic, oversize earrings, and get ready for 1985. If you can remember back that far, you probably also have your Sony Walkman locked away somewhere, thinking that you’ll use it again someday. Besides, the 80s are cool again right now. Even if 1985 doesn’t strike a memory chord, you can relive those days with one of these books, which hit The New York Times Best Seller List for the week of September 15. Radical, dude! I’m sure you’ve seen a ton of info-graphics lately. They are basically just visual representations of information (this site offers one a day on random stuff), and I’ve wondered how easy they are to create. You could probably design them using any graphics program – a librarian at the Lawrence Public Library in Kansas did this one on The Hunger Games readalikes using PowerPoint Publisher – but like anything when you’re starting from scratch, it can take some time. So, I researched a few of the sites that do it, for free, just to see how they work. Not perfect, but not too bad. 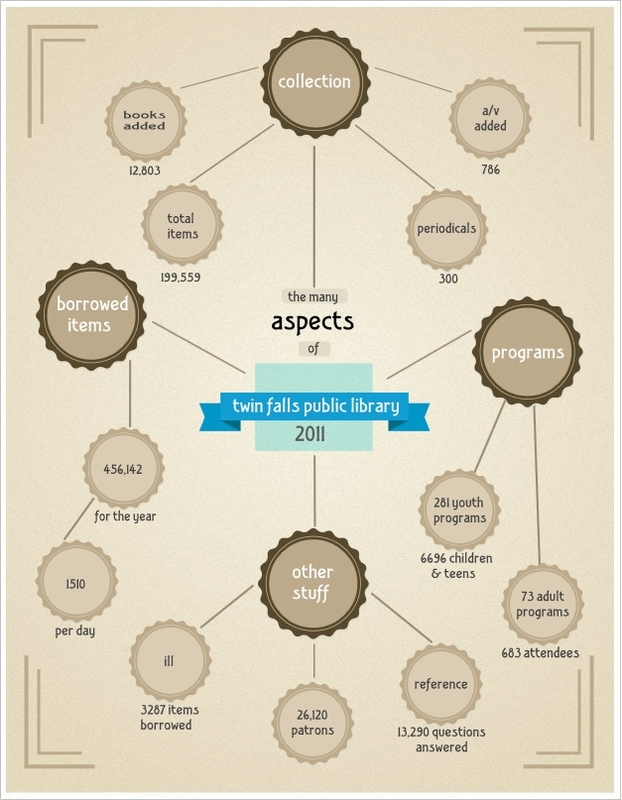 And, it gives you an idea of the scope of our services and programs. If you’re looking for a fun or more interesting way to present information, you might try creating an infographic. See what kinds of cool (or boring) info you can jazz up! Sherlock Holmes seems to be rather popular recently – perhaps because his methodical, observant mind is a bit of an antidote to the forensic-technology-heavy procedurals we’re used to. In addition to the original creation, we’re seeing modern interpretations and works inspired by Holmes. Sir Arthur Conan Doyle might have been surprised at all of the ado over his enduring character, but then again, Sherlock always was a bit ahead of his time.